EJ's dance bag/backpack is finished (WIP here) and she is thrilled! 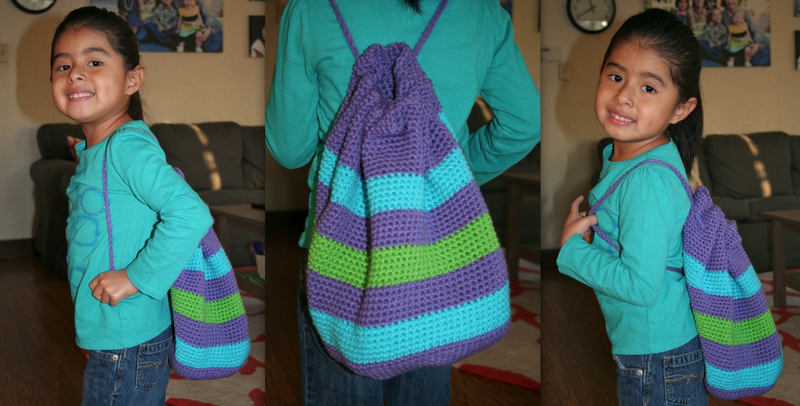 It's a little big (I think if you are looking for a child-size bag making this pattern as written in worsted weight will probably come out perfect) but I adjusted the straps inside of the bag to fit her now but be adjustable in the future as she grows. Love that this was a quick project and that it was such a hit with EJ! So cute! HUGE kudos to whoever chose the color palette - it's perfect! i agree with the color combo, very convivial. Best part is so happy EJ is to have it. Turned out SO CUTE!! and agree with Nora...i always want to learn to crochet after i see how cute your projects turn out! My favorite colors! So cute. Does Liv want one now too?! Love it---it even matches her shirt! The colours are great and the stripes look so pretty and neat.